The discovery of gold in the Aorere area in 1857 resulted in an influx of single men into Gibbstown (Collingwood). A subsequent concern for law and order, by the local residents, led to a demand for the establishment of a local police force. In 1857 The Nelson Provincial Council funded a lock-up, a constables’ rooms and a residence for the magistrate, Henry Gouland, on the site currently occupied by the hospital. In 1880 the old police quarters was replaced by a new building. The original police lock-up was replaced in 1893 and this was later shifted into Collingwood proper, where it was included into the Collingwood Museum buildings. 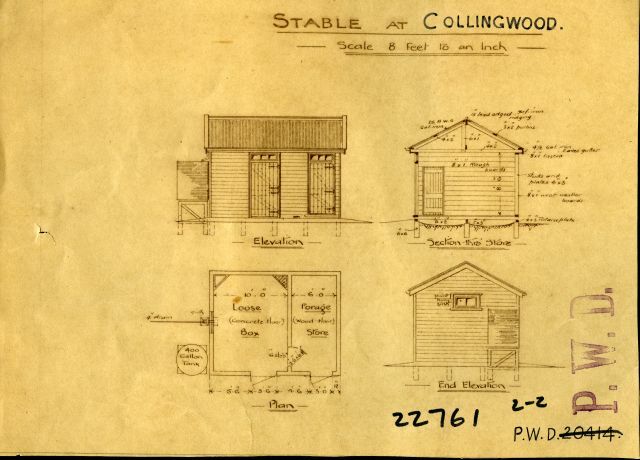 A new court house was built by McNabb and Johnston, contractors of Collingwood, in 1901. 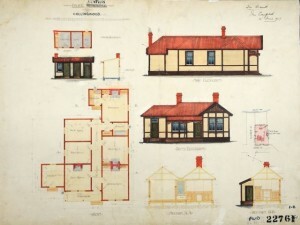 Plans for a new police building were drawn up in 1907 and the contract was awarded to McNabb and Johnston. The house was completed in March of 1908, at a cost of £738, 10 shillings. Constable John Timothy Foley, who served from 1898 to 1910, was the first occupant of the house. The old police house, located on the present Joan Whiting hospital site, was occupied by Dr Fisher. With the demise of mining in the 20th century, issues of law and order at Collingwood tended towards minor fracas and petty offending. Tom Kennedy was the last resident constable and in 1959 the Police Station was closed. Armstrong, David. (1985). Collingwood Courthouse and Lock-up. The Nelson Provincial Museum, Archives, NZHPT files. Neale, June E. (1986). The Nelson Police. Nelson [NZ]: New Zealand Police.